A few months ago I took a beginning birding class from Let’s Go Birding! Although we learned about hummingbirds in the classroom, the field trip the following Saturday covered the gamut. Ever since I’ve enjoyed identifying the birds visiting our garden. I have a nifty “Quick Guide” to commonly seen local birds to help me out. The illustrated guide gives a brief description of the bird’s size and coloring, along with the time of year they appear in your area. They’ve even provided a tiny box so you can check off the ones you’ve seen. Who can resist a little check box? Not me! 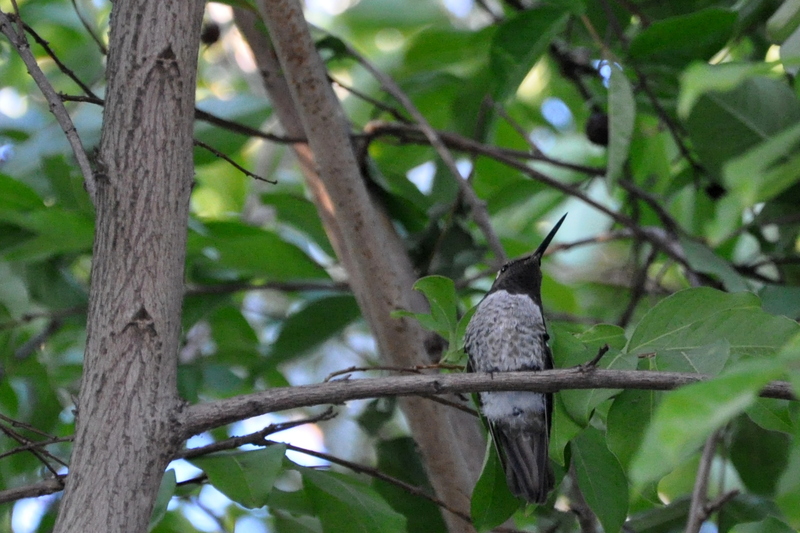 The Ana’s hummingbirds are here year round. We have three feeders to choose from, along with Mexican Sage, Abutilon, Raspberries and a few other flowers they enjoy. During nesting season the females also eat soft spiders and other small insects for protein. I spotted a Lesser Goldfinch this morning in the triangle garden. This one is enjoying Bachelor Button seeds. I didn’t know before today that Bachelor Buttons and sunflowers are from the same family. 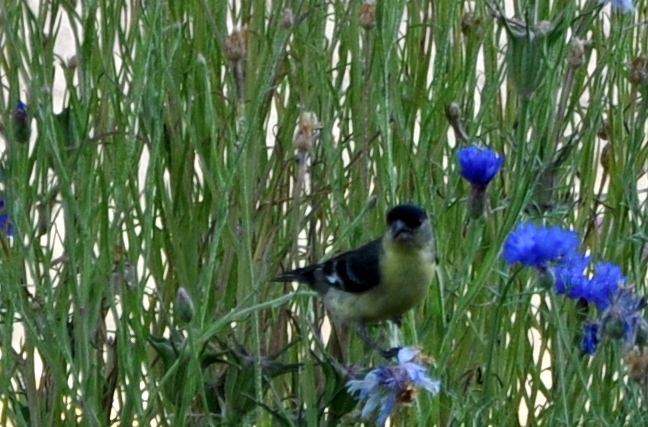 They’re both members of the Asteraceae or Compositae family, a favorite of this tiny yellow bird. 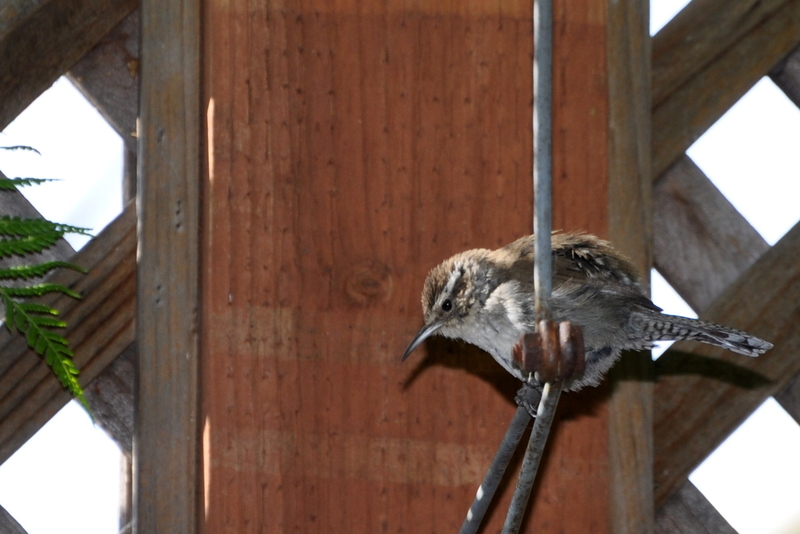 Bewick’s Wrens eat the eggs, larvae, pupae, and adults of insects and other small invertebrates. They’ll occasionally eat seeds and fruit. I spied this one over the weekend on the back fence. Dropped fruit means lots of tiny fruit flies, so as soon as I cleared out with my camera, I’m sure a smorgasbord was under way. 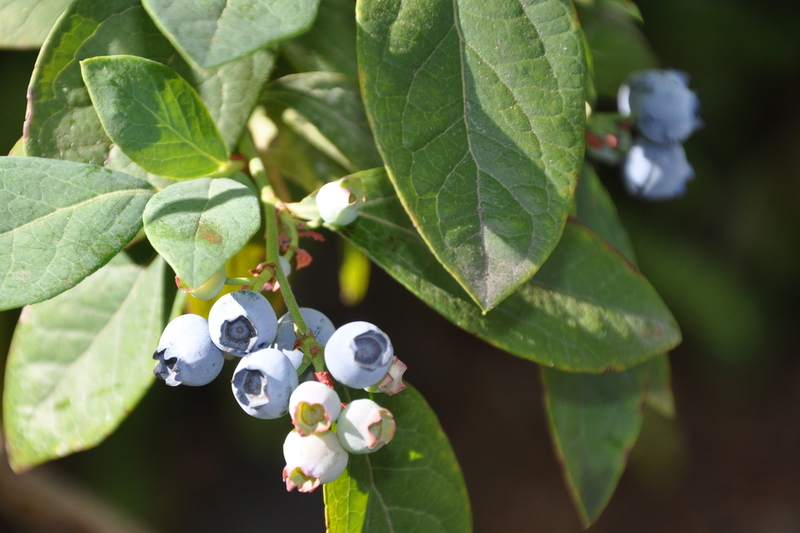 So, what do blueberries and birds have in common? Absolutely nothing. I’m just delighted to have my first handful of blueberries flourishing in the garden. First, a retraction. For the last few years I’ve been stuffing mesh apple bags with laundry lint, an offering for the neighborhood birds and squirrels. I’m not sure where I originally found the idea or if I came up with it on my own. I asked about the lint at a recent birding class, and they said that experts no longer recommend it. The owner of our local birding store said it compacts when wet. According to this Humane Society article it ” crumbles, and it may contain harmful residues from detergents and fabric softeners.” I use green products in the wash and don’t use a softener so I thought it was fine. Now that I know better, I’m spreading the word. Conversely, the birding store suggested offering animal fur. This seemed counter-intuitive to me since birds are cat’s prey, but I decided to give it a go. Instead of tossing the cat fur collected in the brush, I’ve been tucking it into the trees in our garden. Would we have any takers? The answer is yes, and today I got photographic proof. With my camera in hand, I saw a bird lift out of the shrubs with something white in her mouth. Could it be? I snapped from a distance, but couldn’t be sure till I looked at the picture close up. 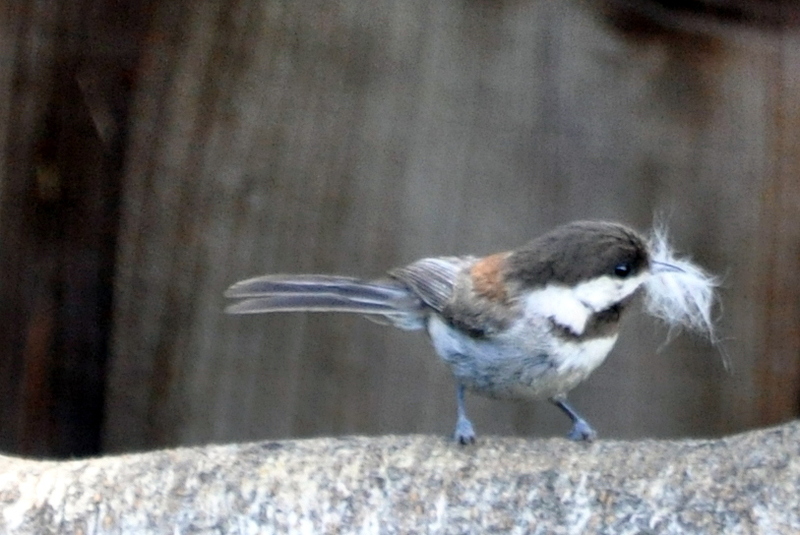 Sure enough, this bird has a mouthful of Beijing’s fur. 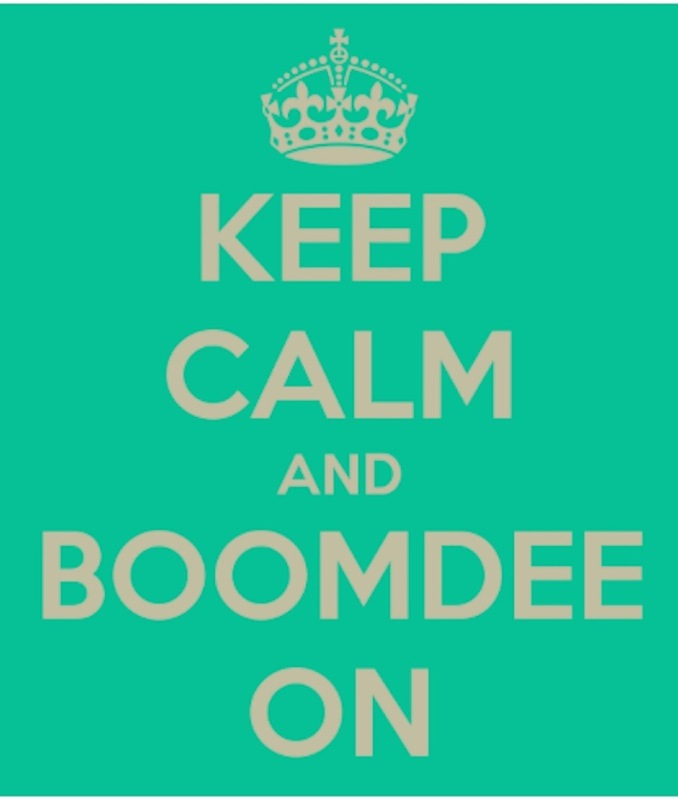 Yeah!!!! So to recap: Laundry lint is bad for nesting but animal fur is a hot commodity. My apologies for leading anyone astray.